t*rexes and tiaras: Snail Mail Collective..
Last month I signed up to take part in The Snail Mail Collective. This is a snail mail swap which is organised by Melyssa and Chelsea each month. I was paired up with Lauren, which was lovely as it gave me a chance to get to know a new blog I'd not encountered before. I spent a little while reading up on her posts before shopping for something I hoped she would like. I'm not posting a photo because I'm not sure yet if she has received it. I arrived home after my weekend to find this parcel waiting for me from Lauren. 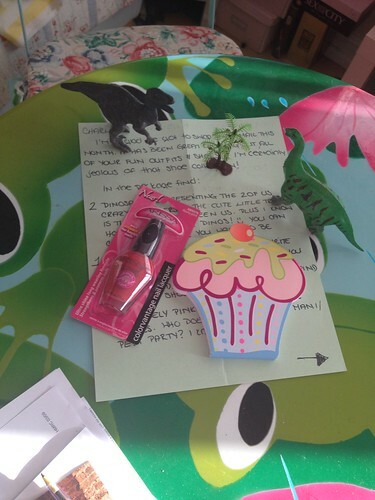 She'd written me a lovely letter to explain her reasons behind choosing the items she had, and had included dinosaurs (win!) a cute notebook and some nail polish. I am going to use it as the push I need to start making more of an effort to paint my nails. If you would like to take part in a future Snail Mail Collective swap, head over here to sign up. Also, if you do like to swap snail mail, have you signed up for the Blogger's Secret Santa I'm organising this year? Details here. I love that you love dinosaurs! haha I was obsessed with them as a kid. There used to be this store only for dinosaur stuff. It was fantastic!!! Cute snail mail items!! I love snail mail! Have a great day! Aw this sounds like such a fun idea! I love receiving snail mail, and your little parcel of goodies are so cute!